Ever thought of turning your home into a smart home? Wouldn’t you love to be able to switch off the lights you left on even after you’ve got to the office? Or turn the air conditioning on before you get home from work? Smart Home devices also can let you monitor the safety of your home, unlock doors to friends for temporary access (even if you aren’t at home to receive them) and even turn your regular appliances “smarter”. Though we’re starting with the most popular of the lot, Nest Thermostat, know that there are plenty of other smart home automation devices that let you do more than just check your home’s surrounding temperature. It looks like things are going to get interesting, at home, in the long run. This is a self learning thermostat that will act as the core of your home heating system and it uses Wi-Fi to let you gain access to control it, even when you’re far away from home. When you first start using this device, you may just use the turn on/off feature for the boiler in your house or set a schedule for the timer to handle your boiler automatically. Instead of that, you can just use the dialer feature to turn the temperature up or down accordingly. Nest Thermostat can also learn your habits, so that it can use its motion sensor to automatically adjust the temperature. 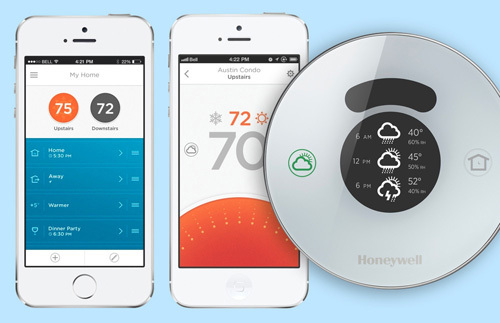 Honeywell Lyric Thermostat is similar to Nest Thermostat, but instead of relying on a motion detector, Lyric uses geofencing to detect if you happen to be in the vicinity of a pre-set area. That way it will know when to turn on/off your electrical appliances automatically. For example, if you happen to be on the way home, Lyric knows that and will automatically turn on your air conditioner to cool down your house. 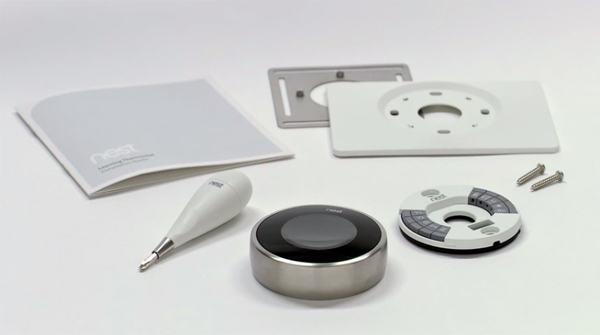 Lyric boasts that it comes with better Heating, Venting and Air-Conditioning (HVAC) control than Nest Thermostat as it takes into account the current weather, inside and outside temperature, and humidity levels before adjusting the perfect temperature for your home. Sentri is not just a temperature-monitoring gadget, it can even be used to monitor your home doubling as your security system. There’s a 360-view camera integrated inside the device that allows you to view your house remotely. You can also make a video call to Sentri through its smartphone app. Sentri is actually less expensive than a traditional security system, and does not require professional installation services as you can start using it right out of the box. 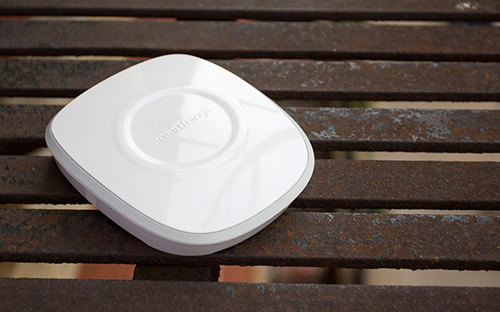 Canary is a simple, out-of-the-box security system that is perfect for those who want to keep an eye on their home remotely; it helps protect your house by alerting you of intrusions. 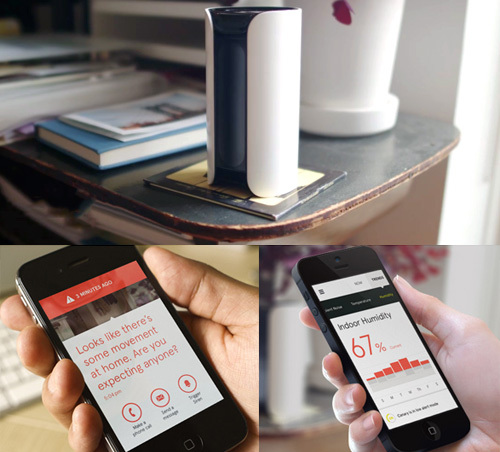 The device itself comes with a camera to monitor your house surroundings, a humidity and air quality monitor and a siren that is good for chasing thieves away. 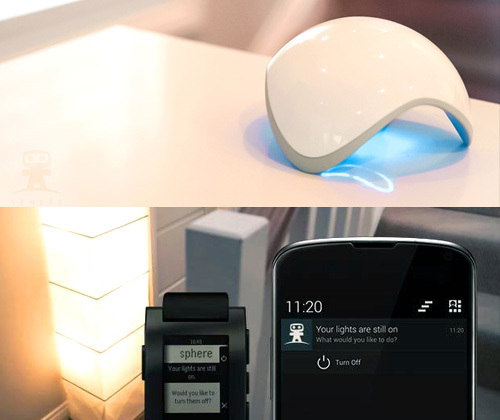 Canary is smart in its own way, as the device will learn your habits. It knows that when you’re home, it doesn’t have to alert you when the doors to your home is opened. 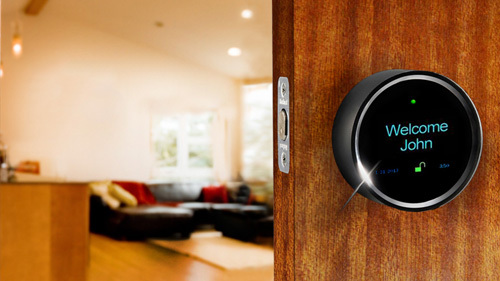 Goji is a digital lock for your home that is not only smart, but also pretty advanced. It works via Wi-Fi and Bluetooth connection. This device can send pictures of visitors at your door, allowing you to enable temporary access to anyone entering your house even when you’re not around. You can also use it to record all lock activities, and using clip-on electronic fobs, it can lock/unlock your doors. In case you worry about what happens during a power outage, you can still lock and unlock your door as normal, but you won’t be able to receive updates until the power comes back on. When you’re using way too many home automation devices, opening the right app for the right device can become difficult and counterproductive. That’s when you need Revolv to become the central automation device for your home. 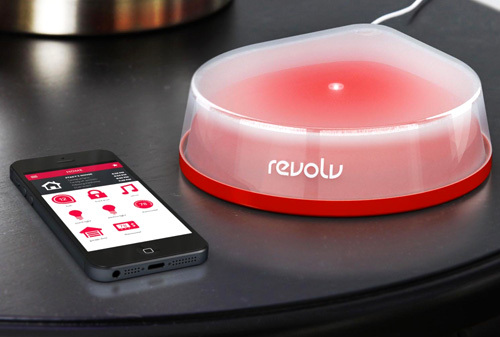 To get Revolv to start working properly, just place Revolv in the centre of your home, have it connected to your Wi-Fi then let it scan for your other home automation devices. Even if it fails to locate them, you can manually add them through the Revolv app too. 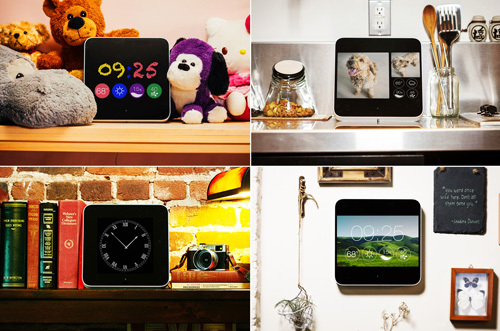 Homey lets you take control of all your connected devices and appliances via the Homey app or voice commands. Apart from ZigBee and Bluetooth 4.0, there are a total of 8 radio modules and Homey supports them all. With Homey, you can order around your house, for example, asking it to turn on the lights in the living room, close the blinds, pick a movie you want to watch and a lot more. All of these settings will have to be pre-configured of course but think of the possibilities. You won’t ever have to look for the remote again! 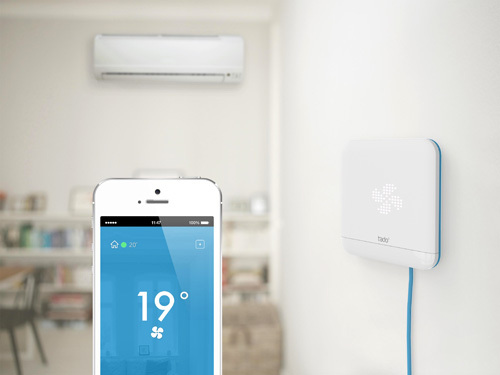 Instead of replacing your old air conditioner with a newer, energy-saving one why not make it smarter with Tado Cooling. Tado can be installed easily, and help regulate your house temperature for example, when you’re awake, out for a jog or work, and even when you’re sleeping. It will adjust the surrounding temperature according to your activities so you don’t have to do it yourself, and in the process, help you shave off your electricity bill. Like Revolve, SmartThings acts as the central hub for all your appliances but it goes the extra mile by remembering your daily routine. Through its app you can do most of your usual stuff remotely, like turning off lights and switches, and closing and locking the doors. It can adjust the temperature to match the climate, get the right music and lighting according to your situation, and best of all, it can still change its plans and re-adapt to changing patterns with a single push of a button. What is cooler than having a device that is capable of knowing everything about the condition of your house and reporting back to you through your smartphone, smart TV or even smartwatch? Ninja Sphere lets you do this and even includes an ‘if this, then that’ rule that can even be applied to other third party devices that you add to it. 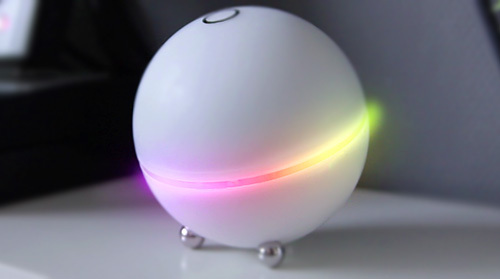 For example, if you happen to have tagged your keys, or pets (dogs or cats), Ninja Sphere can tell you when they’re missing and will make sure to inform you immediately. 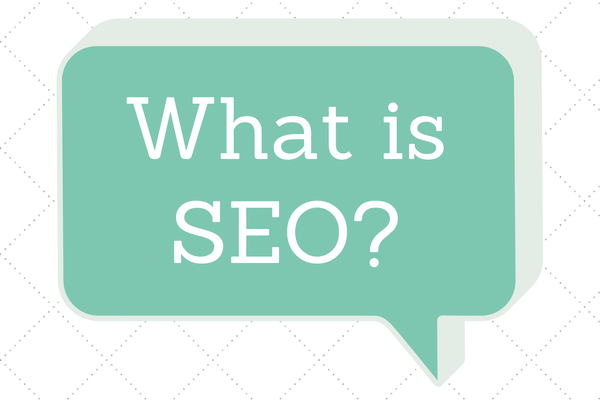 Next articleAre You Ignoring this Important SEO Strategy?